Like noodle soup, I view crepes as another deliciously versatile dish that can be enjoyed any time of day (or night). Crepes disappear faster that hotcakes in our house, so I always try to double or triple the crepe recipe. In one sitting a crepe fanatic like myself can devour anywhere from 6 to 12 crepes. This recipe makes about a dozen. If you ever have leftover crepes, separate them with parchment or waxed paper and they should freeze beautifully. Reserve and set aside 1/4 cup pineapple and half of the mango slices for garnishing later. Dice remaining mango and pineapple. In a small saucepan, whisk together cold juice and cornstarch. Turn on heat to medium-low and bring to a simmer, stirring frequently. When thickened, add ginger, 1/4 cup diced pineapple and diced mango. Continue cooking and stirring until sauce is of the desired consistency. Remove pan from heat and stir in honey, maple syrup, and/or sugar to taste. To make the crepe batter, beat eggs, add milk, and beat again until smooth (or use a blender). Blend in flour and sweetener until a smooth thin batter forms, adding more flour or milk if necessary. Let batter rest for 10 minutes or more. Preheat a greased or oiled skillet over medium heat. Pour about 1/3 cup batter into the center of the skillet; quickly tilt and rotate the skillet to spread the batter into a thin, round layer. Cook until bubbles form in the middle. Flip crepe and cook the other side until light brown spots appear and center is cooked through. Transfer cooked crepes to a plate and cover with a lid or waxed paper to keep them moist and flexible. 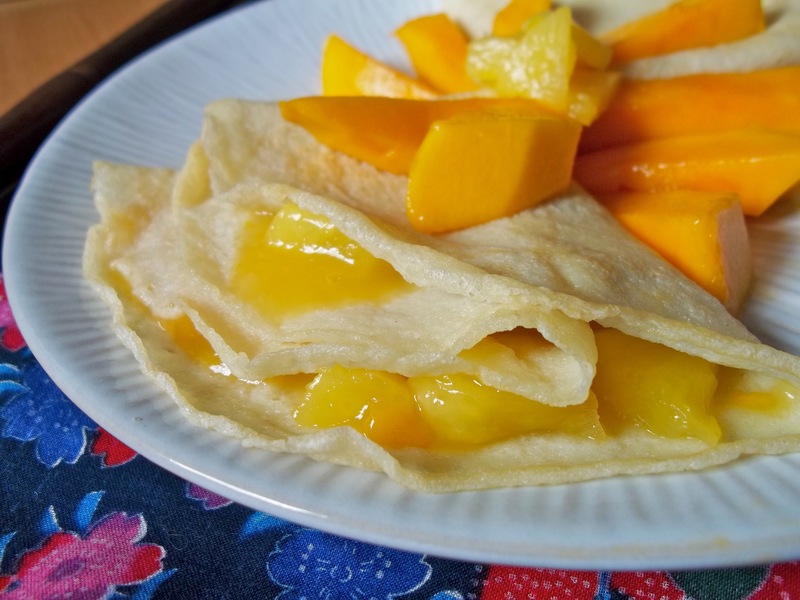 Before serving crepes, place fruit sauce in the middle of each crepe and roll up or fold in quarters. Top with reserved slices of mango and pineapple. An optional dollop of whipped cream (coconut cream) is lovely too. I’m sharing this dairy free recipe at Allergy Free Wednesdays , Foodie Friday, and Saturday Dishes. These are lovely. What a fantastic way to start the morning. Pinned! I hope you get to enjoy them soon! 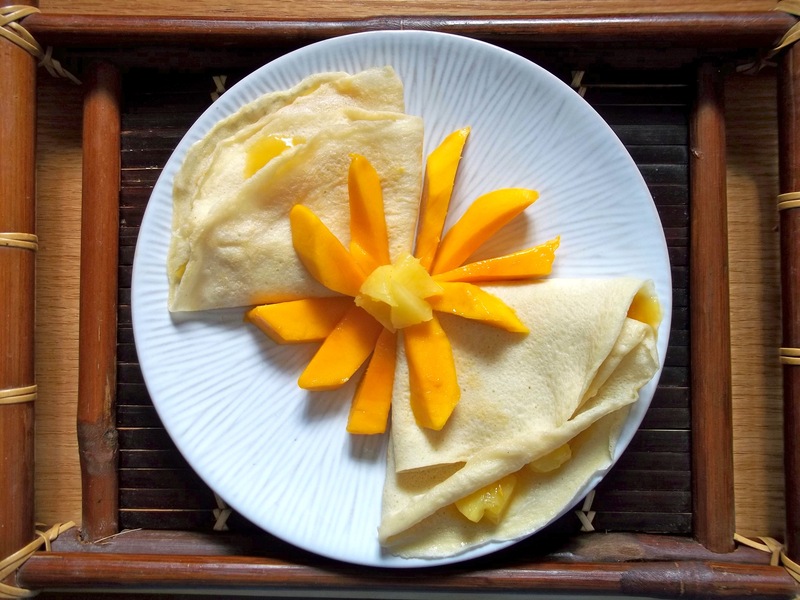 You had me at mangoes in crepes. Seriously, mango is my THE favorite fruit and I eat it in every possible way. I would use gluten free flour to make these. Thanks! I would love to hear how these work with gluten free flour. It might be better to use dairy milk in that case, since coconut milk doesn’t have protein to bind as well. What a beautiful breakfast! I love crepes! Thanks! I hope you get to try them! Such a beautiful display! Will make these crepes for breakfast. Reminds us of our time in France. The French love crepes. But your crepes bring the enjoyment of crepes to a even higher level! Pineapples n mangoes – I have both in my fridge now. such an excellent pairing of fruits n crepes! Impressive!!! Thanks, Bee! Enjoy them! And I did make some pineapple tarts around Chinese New Year. Delicious!